I have been very blessed during 2012 to have the opportunity to write several articles for Minnesota’s leading Holistic/Metaphysical Magazine called THE EDGE. Here is my latest piece … The Blessed Gift of Liz’s Presence. 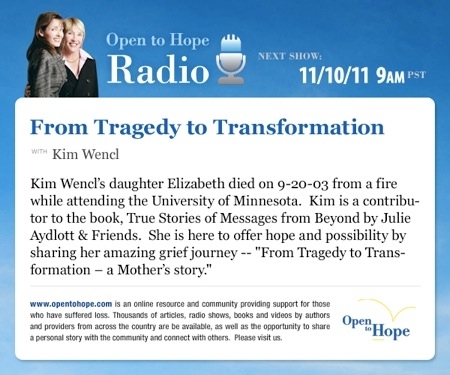 Many extraordinary experiences have come my way since my daughter’s sudden and tragic death nine years ago. Very early on, when I needed it most, I was shown unequivocally that Elizabeth was alive in spirit and living a new life filled with joy and happiness. These signs and experiences brought me the peace and validation I so desperately needed in order to go on with life again. However, there came a point when I no longer needed any validation that Liz was still very much a part of my life and always would be. Gone were the days when I would wake up each morning and ask for a sign that day. It was no longer necessary. Liz didn’t need to prove her continued existence to me — she had done so many times over, and I was confident in that reality. I also worried that I might somehow hold her back if I continued to need constant affirmation of our connection. It took time, but eventually I was ready to completely let her go. We were both in good places…we were always aware of the strong bond of love that would always unite us. We knew where to find each other if we really needed to. So, one morning as I meditated, I took a deep breath and told Elizabeth that I was setting her free. I no longer wanted her to cling so closely to me. She was free to go and do whatever heavenly tasks awaited her. Life went on and each day brought new joys. Family has always played a very important role in my life. As the oldest of four children and living only one block from my parents for the past thirty years, life has always been about family — celebrating our triumphs, achievements and milestones and supporting each other in our failures, disappointments and losses. 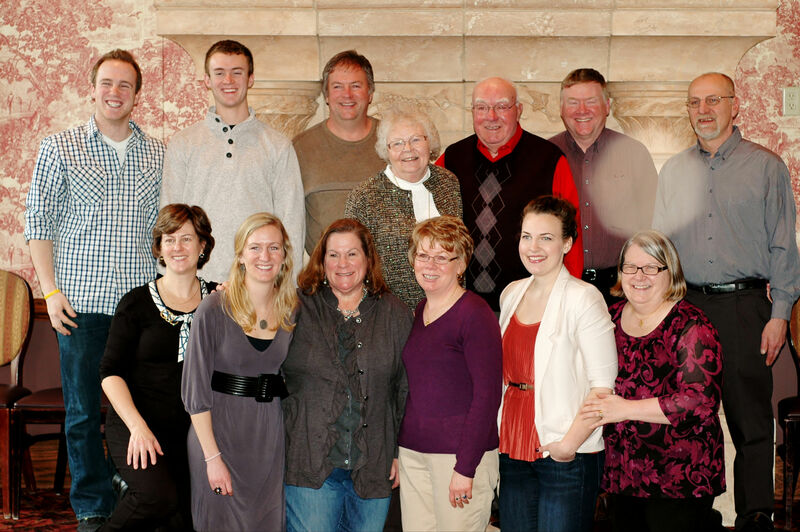 My father’s 80th birthday was just a few months away and I planned a gathering of our family at a local restaurant. I secretly hoped we’d have a private room, but after a couple of calls, it didn’t look very promising. I was disappointed, but I knew the party would still be special — but I sure was hoping for our own room! The day of the party dawned and we all headed to the restaurant. As the waitress led us to our table, I was pleasantly surprised when we were directed into this large, beautiful room set with a beautiful table and a roaring fireplace. We had our own space after all! I was overjoyed, and it wasn’t until much later that I really began to wonder just how that had come to be. My cousin, also named Elizabeth, joined us, and she brought along her camera. 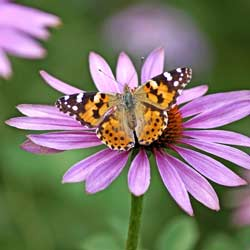 In addition to working for a photographer, Beth is also an avid picture taker on her own. She took many candid shots during dinner. As the celebration came to an end, we all gathered around the fireplace for one last group photo. The next day, I received an urgent email from Beth. “You have to see this picture” she told me. “You are not going to believe it!” I opened the photos and perused them all. They were wonderful and really captured the joy we all had as we helped Dad celebrate his special day. “There’s just one more you need to see,” Beth wrote. I opened the last photo and there was the group picture we had taken in front of the fireplace, just before we left. I slowly scanned the page and was happy to see that we all looked really good! But my eyes stopped abruptly and my breath caught in my throat — and I couldn’t believe what I was seeing. Just above my head, next to my husband, was a huge orb. It literally took my breath away as the realization of what it meant hit me. Beth realized it, too. “Liz was with us, too,” she told me, and I absolutely knew that was true. It was Liz’s sister, Anna, who reminded me that if Liz had been physically with us, she probably would have been standing right where the orb had been. “Can you believe it, Mom?” Anna excitedly asked me. Even though I had vowed to let Liz go, she still chose to join us for this special time. As I showed the photo to my father, tears filled his eyes. “This is the best birthday gift I could ever have been given,” he told me, as he hugged me tight. As I thought about everything that happened that day, so many things came together. My cousin Elizabeth joined us. If she hadn’t been there, no pictures would have been taken. The private room — how had we mysteriously ended up with it? How could this have happened? We each now have a reprint of this picture in our homes, and as I look at that beautiful picture each day, I smile — because I know the answer — it is love. Copyright © 2012 Kim Wencl. All Rights Reserved. The New Me is Someone I Never Expected! In high school I was extremely shy and a complete introvert. I felt awkward and didn’t feel like I fit in anywhere. Of course, looking back now, I know that wasn’t true – but at that point in my young life it was definitely my perception. Very early on I made some decisions that were in my book, non-negotiable. Public speaking was at the very top of my list. I can remember giving speeches in high school and my knees would shake and my hands would quiver, and I was so nervous I couldn’t even think straight. Things have changed dramatically for me through the years. I am more outgoing now and open to meeting new people and creating new experiences; which is what time and living life bring about. There is a saying that you can’t teach an old dog new tricks … and sometimes I guess that is true. But what I’ve come to realize is that if the old dog is willing … anything is possible. Never in a million years could I ever have imagined that I would bury my 20-year old daughter. It was not the right order of things, and it still isn’t. It was non-negotiable … but it happened and suddenly I had to incorporate it into my life, make peace with it, and work through all of the painful emotions to find joy again and a life worth living. Once I accepted the reality of my daughter’s death, it was easier for other things that I had once considered non-negotiable to be held up for change. Because of the strong connection that I still shared with Elizabeth I had an extreme sense of gratitude to God and The Universe at large. I was no longer a stiff board of do’s and do not’s. My life became malleable and I was molded into something far greater than I could have ever imagined. There is a saying that God can dream a dream bigger than you can ever dream for yourself. I can see this so clearly in my life since that fateful day in September, 2003. Public speaking has now become something that I do at every opportunity. And my topic is always the same – the most painful experience of my life – the death of my daughter, my journey through it and coming out the other side and back to embracing and loving life again. The first time I spoke I had practiced for months and questioned my sanity daily. How can I possibly speak in front of strangers about the most painful time of my life? In truth, I didn’t know. All l knew was that my story was important and sharing it could be the catalyst for others to view their own life situations in a different way. I also was confident that if I did everything I could to prepare, The Divine would step in to help me. This certainly was the case. In fact, when I finished that first talk, I felt the strongest sense of accomplishment I have ever felt … it was a complete sense of euphoria. Spirit had asked me to step up and I had done so. Not without some fear and trepidation — but with the knowing that I would receive help whenever I needed it. The strong presence of my daughter permeates my very being whenever I share our story. In a sense we have become a team and we work together from both sides of the veil to help others. For me, there is no greater calling. What will the next 40 years bring? I don’t know, but I look forward to whatever adventures Spirit sends my way! Life is JOYOUS! I became quite fearful and guarded. I knew that not everyone would embrace my experiences the way I did and would hardly see them as “Godly.” In fact, I knew there were some who would say my experiences were most likely “of the devil” – even though the bible was filled with stories of angels and visions and prophesies. The journey to come to terms with my experiences of signs and messages from the dead, working with mediums and harnessing my own intuition was a rocky one. I would secretly quiz those I came in contact with to see if I felt they were open to hearing my story. At times, it was a very lonely and frustrating exercise in futility. I was at a crossroads. I knew my experiences were meant to be shared with the world, but how would that happen when I couldn’t even muster the courage to share them with most of my immediate family? I had no answers. I only knew that The Universe was in charge and when the time was right it would happen. Of this, I was completely certain. Eventually, my story became “known” and I knew that it was only a matter of time before word reached my parents. After all, we live in the same town only a block away from each other. I knew I needed to be the one to share it with them – not some acquaintance out on the street. My experiences had even become part of a book, True Stories of Messages From Beyond, and still my parents were in the dark. It all came to a head at a family reunion. Several of my cousins and an Aunt and Uncle or two had read my story. We had no more than exited the car when they approached me and began to share how much they had enjoyed reading my story and how amazing my signs and messages had been. I would quickly thank them and then pull them aside and whisper that this was all fine and dandy but hey, my folks don’t know anything about this – so don’t mention it to them okay? By the end of the day I knew how absolutely ridiculous the situation had become. It was clear the time had come to share my secrets. I dropped Mom and Dad off at their home and returned to mine. I went into my office and pulled a copy of my book off the shelf. I returned to my childhood home, finding my Mom busy in the kitchen and my Dad enjoying an afternoon nap. “Mom, I said, I have something to tell you and you need to sit down. “I don’t think you are ready for this, but I wanted you to find out from me and not someone else.” I laid the book in front of her and she read the cover. She opened up the pages and saw my story of Elizabeth. Much to my complete shock, she proceeded to tell me that she wasn’t surprised. She had googled my name a while back and knew all about it! I returned home and no more than an hour later my phone rang – it was Mom — she had already finished reading my story and she told me through her tears how proud and happy she was. I look back on that time now and all I can do is laugh. I was so sure that my experiences would be discounted that I didn’t give my family a chance. I have now come “out of the spiritual closet” and have only encountered a smattering of souls who did not approve of my experiences, and that’s just fine with me … after all everyone is entitled to their own beliefs. I would never force my personal beliefs on anyone. All I can continue to do is to share my journey in the hope that perhaps it will help someone else along the way … always with God leading the way. September 20, 2003, was a defining day in my life. In the early morning hours of that Saturday, my daughter Elizabeth and two of her six roommates died of smoke inhalation in their duplex, just blocks from the U of M where they were all beginning their sophomore year. That day my life was forever changed. One door was slammed shut in my face and I kicked and screamed and begged God to open it again. And he did…not in the same way of course, but in a way that brought me to re-connection and a new way of embracing and viewing the world and a return to JOY. Those first days were fraught with pain and disbelief…but they also brought me overwhelming clues that all was not lost, that Liz and I would find each other again, in new and amazing ways. It has been said that when the student is ready, the teacher will follow. This was certainly true in my case. Within two months of my daughter’s passing, I learned of the work of Kathryn Harwig. Kathryn helped Liz and me to forge a new connection. She helped to facilitate a peace and return to joy, along with the absolute knowing that my daughter was indeed safe and happy on the other side of the veil. My journey, however, had just begun. I slowly realized that the Universe had a bigger plan in place. It took time and patience, but I began to write about my experiences with my daughter – both while she was here and after she left the physical world. Not only did writing aid in my grief healing, but it also brought me to the realization that my journey was meant to be shared with others. I had absolutely no idea how this would happen; all I knew was that my task was to write. And write I did. I poured out my heart and soul for a solid month. And when I finished, it felt as if a huge burden had been lifted from my shoulders. Two years later, my story was published in True Stories of Messages From Beyond by Julie Aydlott & Friends. As I held that book in my hands for the first time, it was crystal clear that the Universe had been the author – I had been merely a willing participant. I began to realize that the lessons I learned were important and I needed to do more than write about them. I needed to speak them. You must know, however, that I have gone through the majority of my life saying that there were certain things I would never do – and public speaking was at the top of my list. I also felt an intense sense of gratitude to the Universe for giving me the experiences of the past several years – so much so that I was open to putting my fears on the back burner and stepping out in faith to share my story. Once again, I had absolutely no idea how this would happen, but I was confident that, if this was my destiny, the Universe would take care of the details. On April 20, 2007, my opportunity was at hand. I was the speaker at the monthly Intuitive Forum sponsored by Kathryn Harwig. I had practiced for months, and there were many times when I would question my sanity. How can I possibly speak, not only in public, but speak about the most painful experiences of my life? Could I speak with emotion, but without becoming emotional? In truth, I didn’t know. All l knew was that I had prepared myself the best I could and now I needed to let the Universe take over. I followed my gut and it went off without a hitch. It truly felt like an out-of-body experience, and it brought about a huge sense of complete euphoria. I had accomplished the task I had been given and it felt so good! In a strange way, I had even enjoyed it! I have learned so much about myself and the world around me since that painful, life-changing September day. The Universe has a plan for each of us. It can take us into uncharted, scary waters. But we are never alone. All we have to do is pay attention and follow — work hard, and offer yourself up in service to others. You will receive gifts you could never have imagined. It has been almost nine years since that fateful day, and life for me is joyous! I continue to write, speak, and share my journey with anyone who will listen. When the Universe opens your door, do not be afraid. Step forth boldly and you will go on a journey that you never could have imagined. Please welcome guest blogger, Dave Roberts! I don’t know if I can point to the one most important lesson that I have learned in my life, thus far. Since my daughter Jeannine died on 3/1/03 at the age of 18 of a rare and aggressive form of cancer, many teachings /lessons have made themselves known to me. All of these lessons/teachings have helped me progress from the raw pain of my early grief to adjusting to a world without the physical presence of my daughter. These teachings have redefined me and in the process allowed me to develop a relationship with Jeannine based on pure, unconditional love. I have also been blessed with a supportive group of family and friends who have supported the expression of my experience as I see fit. They don’t view it as good or bad and neither do I. One of the lessons that I have learned in my journey following Jeannine’s death is that labeling an experience prevents us from appreciating fully the lessons inherent in that experience. Labeling someone’s grief experience as good or bad does not allow us to fully appreciate and learn from the challenges that they have encountered along the way. I have been an addiction professional for 27 years and have also observed the impact of diagnostic labels on how we view clients/patients that we encounter. If we buy into the stigmas associated with labeling, our resulting biases will never allow us to get a complete picture of how the client sees the world and the inherent strengths that they bring to therapy. Doing what we perceive to be the right thing does not guarantee a life that is pain free: Before Jeannine’s illness and death, I always thought that if I worked hard and did the right thing, that God would protect me and my family from harm. However, as God and my experience as a bereaved parent has taught me there are no guarantees in life. Life isn’t about being fair and unfair; it is about learning to negotiate the many challenges that are presented along the way. If we can successfully negotiate these challenges, we develop resiliency and a renewed sense of purpose. We learn to get stronger at the broken places. There is a difference between entitlement and gratitude: In the early part of my grief journey, I regularly questioned God as to why He chose me and my family to bear the burden of burying one of our family members at such a young age. After all, we had always done the right thing in our lives; because of that we were entitled not to bear this burden of grief. I soon discovered that there were many more parents whose children predeceased them. Connecting with them helped me learn gratitude for having them in my life and gratitude for the present moment. There is spirit in everything and in everything there is spirit: Many parents that I know have been graced with signs from their children (as have I). Let the signs that you experience not only validate that our children are with us in a different from of energy, but allow you to see yourself as a truly spiritual being. If we can commit to this way of life, it allows us to see life and death differently. We can change our perspective on life and death, if we choose to do so. All of these lessons have changed how I view the world. I am not the person I was before Jeannine’s death and frankly I don’t know if I could identify with that person. I have become a more loving, spiritual and centered individual as a result of the struggle with Jeannine’s death. Does it mean that I miss her physical presence any less or that I have achieved closure (a process that doesn’t apply to our journeys after the death of our children)? Absolutely not! My journey as a parent who has experienced the death of a child will be life long. I know that I can revisit the emotional pain of Jeannine’s death at anytime. Today, I don’t have the same dread about re-experiencing it. I am, however, more conscious of it and try to discover what my pain is trying to teach me. We can learn from everything, if we are open to it. David J. Roberts, LMSW, CASAC, became a bereaved parent after his daughter Jeannine died of cancer on 3/1/03 at the age of 18. He has been employed in the addictions field for 27 years and is also an adjunct professor in the psychology and psychology-child life departments at Utica College, Utica, New York. Mr. Roberts also developed a topics course on Parental Bereavement issues, and teaches a Death, Dying and Bereavement course for Utica College. 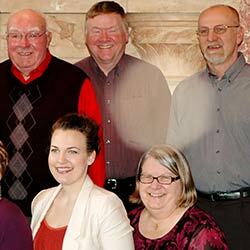 He is a volunteer for Hospice and Palliative Care, Inc, in New Hartford, New York and a member of the All Inclusive Care for Children Coalition. Welcome guest blogger — Heather Von St. James! Finding out you have cancer is not an experience that most people would celebrate, and I was no exception. It seemed particularly unfair that the diagnosis came just three and a half months after the birth of my precious daughter. This was my first child. It should have been a time of great fun and delight. Instead of congratulations, I was presented with the devastating diagnosis of malignant pleural mesothelioma on November 25, 2005. This is an extremely aggressive cancer with a dismal survival rate. Why me? Why now? Then it hit me: why not me? When would be a good time? I decided not to give in to despair, but to meet this disease head-on. I had a beautiful daughter to bring up. I wanted to be there for her first day of kindergarten and her final day of high school. I wanted to witness her walk down the aisle on her wedding day. I wanted to rejoice with her on the birth of her own children. I wanted to be there to cheer her on through good times and bad. I had to beat this cancer in order to do that. I had to keep hope alive and well and fighting for me every minute of every day. This started with a referral to a leading mesothelioma doctor who started the process of replacing terror and despair with hope. Along with hope, I turned to laughter. The day of my surgery happened to be Ground Hog’s Day. What better name for the tumor than Punxsutawney Phil? This was one groundhog that should never see his shadow! We began to celebrate Groundhogs Day, renaming it Lungleaving Day. That was the day my diseased left lung was removed. It left, taking with it the tumor. Good riddance. Don’t look back. It has been a long road, but each day is celebrated as a victory. We laugh a lot at our house. We love a lot, too. Along the way I have met so many courageous and delightful individuals. I wouldn’t have known these new friends if I hadn’t received that diagnosis, awful as it seemed then. I’ve dedicated my life to celebrating hope, for me, for all other cancer survivors, and for all other people who’ve been diagnosed with this disease. Hope for the patients and their families, husbands and wives, brothers and sisters, cousins, uncles and aunts. Hope for all of my new friends. Hope for myself, and most especially, hope for my little girl. My life has a new sense of purpose and fulfillment. I want to help others who face this diagnosis and work toward recovery. Laughter rings through the house on a regular basis. On that day years ago, I could not have guessed the joys that would come to us because we are in this fight. Hope is a rare and precious gift. It’s also free to anyone who needs it. You just have to reach out to the person next to you, give a smile or a hug, welcome the new day with thankfulness, and have a laugh ready for tough moments. Laughter and tears and the hugs of loved ones get you through the days. Heather Von St James is a mesothelioma survivor and a guest blogger for the Mesothelioma Cancer Alliance. Her story is one of hope and inspiration and she hopes to spread her message to anyone who may be going through similar situations to her own. Elizabeth Helps Grandpa Celebrate His 80th Birthday! Yesterday was my Dad’s 80th birthday. I had so much fun planning a little party with our family on Sunday. As time went on new ideas to honor him popped up. I put flowers on the altar at church in his honor. We put his picture in our local paper, and he even made the 10 pm news last Friday night! We had a wonderful time on Sunday celebrating and honoring Dad. Yesterday we all received a gift that we will all honor and cherish forever. My cousins, Dawn and Beth (Elizabeth) and their husbands, joined us in the celebration. Beth works for a photographer and loves to take photos. All throughout the afternoon she was taking them. Yesterday I received a note from her about one of the family pics. There was a huge white spot right above my head and close to my husband Roger and my daughter Anna. When Beth first noticed it she was alarmed that something had gone wrong with her camera and perhaps all the photos would be ruined. Not the case – the white spot, otherwise known as an “orb” was only on one picture. Excitedly I printed the photo out and called my Dad over. He came into my kitchen, and I told him I had one final birthday gift for him but he’d better sit down first. I explained what an orb was and the significance of it, and then laid the photo down in front of him. He studied the photo from one side to the other and suddenly the realization hit him. His precious first-born granddaughter, Elizabeth, had made her presence known on a very special day in his life. We both shed tears of joy, and now we really do have a photo of the entire family! The power of love cannot be broken — not even by death! A few days ago I had the honor of sharing my story on Life Conversations Radio. Click on the link below and check it out! Dr. Gloria Horsley on Thursday, November 10th at 11:00 am CST! 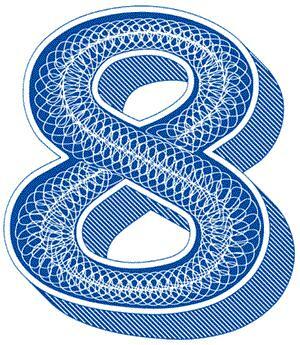 The number eight has been rolling around in my brain for the past few days. I assumed it was because we will soon be marking the eighth anniversary of my daughter’s death. However, it dawned on me yesterday that there was more to it than that. I realized that September 12th would have been her 28th birthday and eight days after her birthday is the 20th – the day she died – eight years ago. As all of those realities sank in, I began to see the number eight in my mind’s eye. And I began to pay attention. Notice that once you put your pen on paper you can make an eight in one fluid motion and you have two circles that intersect one on top of the other. This is a metaphor for the relationship that Liz and I continue to share. Our lives will always intersect. She will always play a part in my life and I will always play a part in hers. Each circle represents one of us. The top circle represents Liz because she is now on a higher plain than I am. Her energy vibrates at a much higher level than mine does. She has moved on to a higher plain of existence or heaven, so she is the top circle – I continue my work here on earth so I represent the bottom circle – we are in different worlds – but yet still solidly connected. Look again at the eight — it is like a path that can be followed. You may start out at the top and work your way down (to earth) and then continue to go back up — Liz did that. Or you can start at the top and continue down and follow the same road as long as you need to and then you switch lanes and move up — but whatever your path you always remain connected. Whenever September rolls around I try to make sense of things — but most of the time there is no sense to be made — it just is. Choices were made and consequences followed — for both of us. But what gives me comfort and solace today is the gentle nudge that I believe Liz is giving me to remember that just like the number eight our lives will always be intersecting with each other. And one day, when my job here is complete I will move to that top circle and we will truly be together – two balls of love-filled energy. That knowing makes me smile and it is what will make the days of September just a little bit easier to bear. Thank you Liz — once again — you never cease to amaze me! PS – I just realized – today is the 9th – I should have paid more attention and made this post yesterday! Oh well.